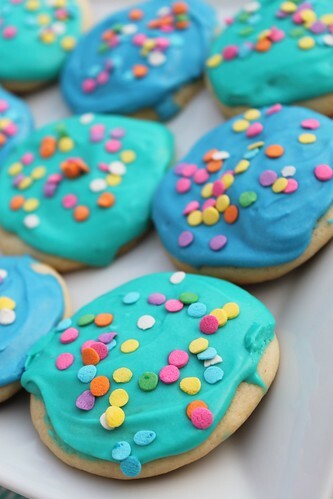 There’s something about those store bought, frosted, cake-like sugar cookies that just makes you want to eat one. I actually remember the first time I tried one I thought to myself, “This might be the most artificial tasting cookie I have ever eaten”, yet for some reason I continued to eat them, with their chemical preservative taste and all. I think they must put something in them that just makes you fall in love, despite the fact that you are eating a “fresh” cookie with a shelf life of 3 months. Well, if you have become addicted to those cookies, consider this your saving substitute. These cookies taste like a better, preservative free version of the store bought cookies. Granted, there is still quite a bit of artificial dye in the frosting :-). I made these to take in for my last day in the hospital on my family medicine rotation (sad to leave that place!). My motivation for making these was in part because I really did want to thank everyone who was so helpful on my rotation, and in part because I love having big groups of people to eat my baked goods! I enjoy the actual process of baking even if I don’t eat the end result, but with just the 2 of us here, baking becomes a dangerous habit. I chose blue and aqua for the colors because I wanted something summer-ish and these colors reminded me of the pool. With a heat index nearing 115°, I think we all have water on the mind. You can really pick any mix-match of colors to dress these cookies up for just about any holiday, but I do have a few suggestions as far as the actual cookies are concerned. First, I substituted 2 oz of cream cheese for some of the butter, mostly because I don’t think you can ever go wrong with cream cheese; however, if you happen to only have butter, or you aren’t a cream cheese fan just use 3 full sticks of butter and leave the cream cheese out. Secondly, I was trying to plan ahead, so I made the cookie dough the night before and refrigerated it for about 24 hours. 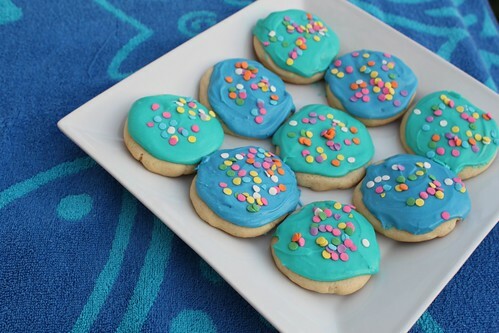 If you decide to make the dough ahead of time, just make sure to flatten the cookies out to the desired shape before baking because they will not spread on the pan if the dough is too cold. Finally, for some reason, I was worried that I wasn’t going to have enough icing… so I went kind of light on some of the cookies. Then I ended up throwing away a bunch of leftover icing. Don’t skimp like I did. After thinking back to the ones at the store, the icing should be almost as thick as the cookie. In the bowl of a stand mixer beat the butter, cream cheese and sugar until light and fluffy. Beat in eggs, one at a time. Then beat in vanilla. Slowly add the flour, baking soda and salt and mix until evenly incorporated. Chill dough for 30 minutes, or overnight. To bake, preheat oven to 350˚ F. Line baking sheets with parchment paper or silicone baking mats. Spoon a heaping tablespoon of dough into your hand and roll into a ball, repeat. Place balls on a cookie sheet 2-3 inches apart. Using your hand or the bottom of a glass flatten each dough ball into a circle. (*Again depending on how chilled your dough is, the dough may or may not spread. If your dough is very chilled, you will need to flatten it into the shape you desire before baking). Bake for 10 minutes. (Cookies should not look brown). Let cool slightly on baking sheet and then move to a cooling rack. Frosting: Place powdered sugar in a medium bowl, or the bowl of a stand mixer. Add the melted butter, vanilla, and milk to the bowl and whisk or stir on low until smooth. Add additional milk if necessary. Tint with gel food coloring if desired. Using a spatula, frost the cookies generously with the icing. While still wet, sprinkle with desired toppings. Icing will harden slightly to allow for easier storage. Keep in an airtight container.